Hurricane Force Gusts - NOT! Let’s start with some basics. The threshold for hurricane winds is when the 1-minute sustained winds equal or exceed 74 miles per hour. Please note the word “sustained”! According to the NOAA Hurricane Research Division, peak 3 to 5-second gusts are approximately 30% higher than their associated sustained winds. This means that a 74 mph sustained wind of a minimal hurricane has gusts in the range of 96 mph. Quite a difference. But that’s just the wind speed. What about the amount of force from the wind onto a surface that is perpendicular to the wind? From high school physics we remember that the force associated with a given speed is proportional to the square of the wind speed. (For the overacheivers out there, the formula to calculate this force is: F = .00256 x V^2, where F is the force in pounds per square foot (psf), and V is the wind velocity in mph) Consequently, the amount of force with a 74 mph gust is 14.0 psf, while the force from a 96 mph gust is 23.6 psf; or 69% higher. The bottom line is that a gust to 74 mph is NOT even close to hurricane force! Update - 1/25/2015 - The National Weather Service Ocean Prediction Center (OPC) and coastal WFOs issue a maritime Hurricane Force Wind Warning product that is defined by NWS Directive 10-303 as sustained or frequent gusts ≥ 74 mph; BUT it is not saying that the gusts themselves are hurricane force. With a "possible" El Niño event forecast for next winter it is important to examine the very broad range of past events that make up an "average" El Niño. Since 1950 there have been a total of 22 El Niños, eight which have been weak, nine in the moderate range and five which have been categorized as strong. [see Oceanic Niño Index (ONI)]. Even within each of these categories there are huge variations. 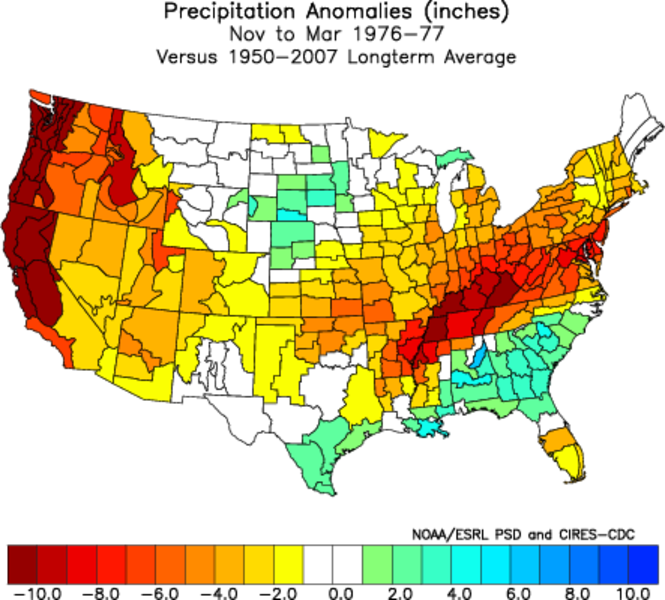 See El Niño and La Niña Winter Historic Precipitation & Temperatures, a catalog of events. The bottom line is that first, any climatology is simply an average over a broad range of previous events. And second, a climatological analysis is NOT a forecasting tool. This and other El Niño data and analyses can be found on the El Niño/La Niña Resource Page. Let the hype begin. CPC has issued an El Nino Watch for the 50% possibility of a weak El Niño next fall from the IRI/CPC forecast ensemble. A similar Watch was issued in 2012 but El Niño never materialized. Already there are headlines about El Niño being the answer to California's drought which only perpetuates the myth that El Niño definitely means lot of rain for California. To put aside this and some of the more prevalent misconceptions see The Myths and Realities of El Niño. 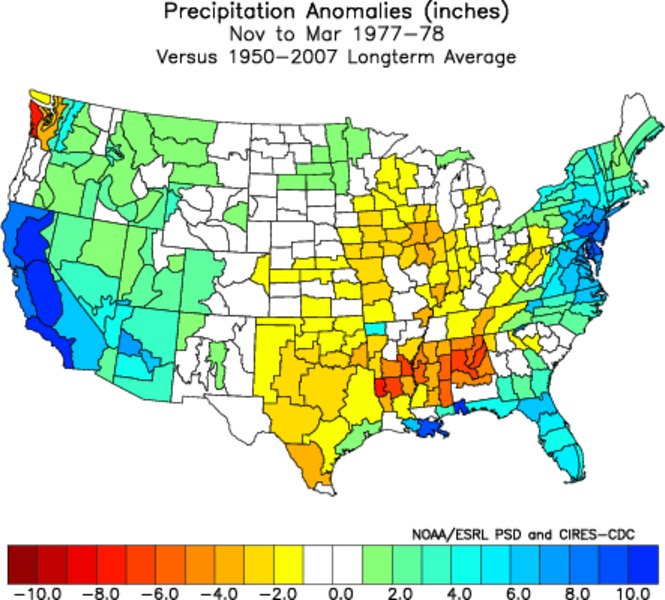 The bottom line is that climatology should NOT be used as a forecast tool. An "average" El Nino is made up of a very broad range of past events! If I were grading this past winter's CPC precipitation and temperature forecasts they would not receive a passing mark. Except for Arizona, New Mexico and the northern Rockies, the forecast bore little resemblance to what was ultimately observed and in some locations was 180 degrees out of phase! A graphical comparison of both the Winter 2013-14 (i.e., December-February) seasonal and monthly forecasts and actual conditions can be found at http://ggweather.com/cpc/2014/. And it should be noted that the normal San Francisco rainfall for the remaining four months (Mar-Jun) is still another 5.60". 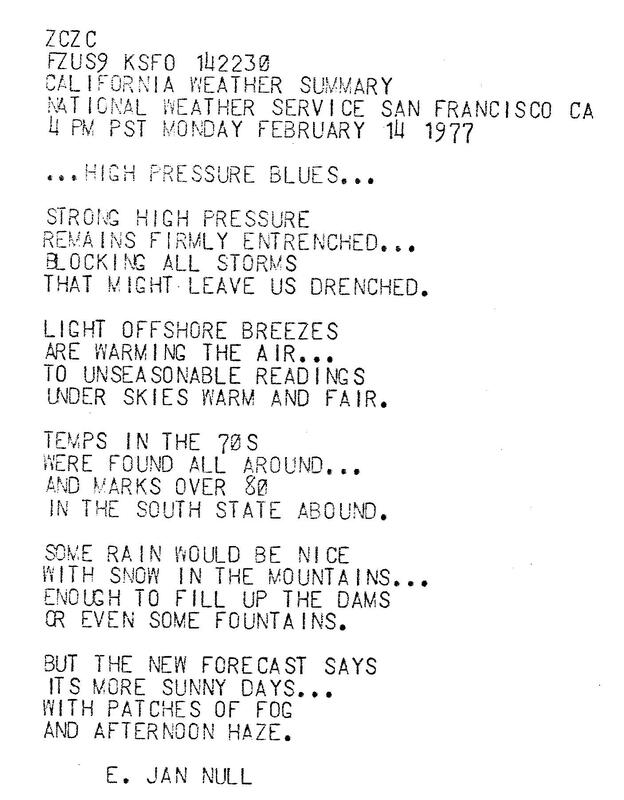 Back during the California drought of 1975-77 I was an Intern at the National Weather Service and decided to be "clever" and write the California Weather Summary on Valentine's Day 1977 in poetic verse titled "High Pressure Blues". (NWS management was not amused) I'm sure all will agree that it's a good thing that I can make my living as a meteorologist and not as a poet. That might leave us drenched. Under skies fair and warm. In the south state were found. But the important takeaway is that while this is a great start, the north half of the state would still need on the order of 4 more equivalent storm systems to get close normal. While I like the visual, the numbers don't add up. The normal accumulated rainfall for the 8-Station Index (8SI) from Oct 2011 through January 2014 is 126.5 inches, and actual accumulated amount has been 92.0 inches. That's a deficit of 34.5 inches. Given http://www.cnrfc.noaa.gov/precipForecast.php?cwa=RSA... a conservative forecast precipitation amount for the 8SI would be about 5 inches or about 14% of the deficit. 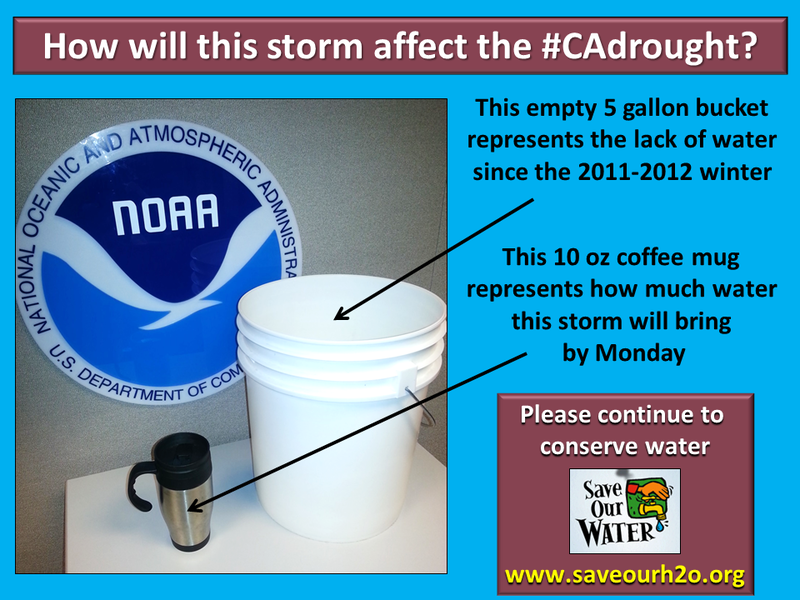 Given a 5-gallon bucket (640 ounces), 14% would be 90 ounces or 9 of the displayed 10-oz mugs.